Her family is not buying that tale, nor should they. They insist that her slaying was an assassination prompted by her leadership of high-profile campaigns against hydroelectric projects, illegal loggers and plantation owners. The Mexican activist Gustavo Castro Soto, also wounded in the attack, charges that the crime scene has been altered and alleges mistreatment by police. He is eager to return home, but he has been prevented from leaving the country. Mr. Castro should be allowed to depart now, recuperate and live on to testify another day. The handling of Ms. Cáceres’s murder will be a test of the Honduran security and justice systems. In a nation where crime and official impunity are rampant, Honduras endures an alarmingly high rate of unsolved homicides—particularly among its environmental and indigenous activists and journalists. Ms. Cáceres was surely aware of the risks she was taking; now the global community must honor her courageous witness and insist that the investigation into her death be pursued wherever it leads. The local church should stand with indigenous and environmental advocates in Honduras to insist on it. 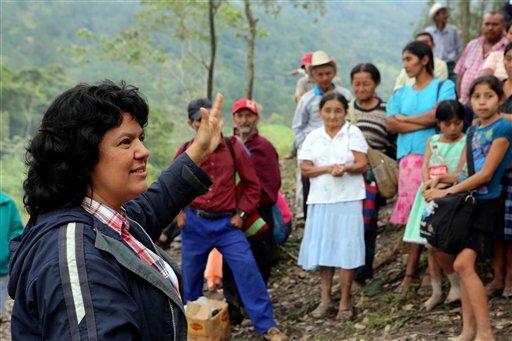 International lenders who have supported the hydroelectric project that Ms. Cáceres and her colleagues have so long resisted, the Agua Zarca Dam in the Gualcarque River basin, should use this tragedy as an opportunity to re-examine the integrity of the “investment” they are making in the region. This article also appeared in print, under the headline "A Martyr in Honduras," in the March 28, 2016 issue. St. Thomas arrives at the very center of what happened at the Last Supper, of what would happen the next day on the cross and of what happens at every subsequent Eucharist. With his own hands, Christ gives himself to us.